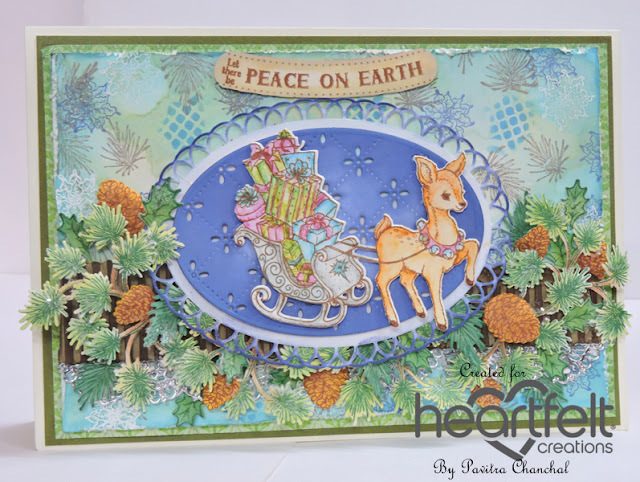 Spread a little Christmas joy and happiness featuring these warmhearted inspirations with the new Merry and Bright Collection from Heartfelt Creations! Share cheerful Yuletide greetings and well wishes with a fun and cutesy paper collection overflowing with precious outdoor scenes of cozy snow laden cottages, beautiful birds nestled in delightfully decorated pines, and pleasing decorative holiday arrangements! Brimming with delicate snowflake accents, gorgeous floral clusters, charming polka dots and beautiful brocade patterns all encompassed in a non-traditional color palette of frosty blues, tantalizing teals, magnificent purples and pretty pinks, this paper collection is one that will surely have your holiday projects standing out from all the others received this holiday season! A sweet and desirable assembling of cling stamp sets paired with the coordinating dies culminate a perfect assortment of illustrations including beautiful evergreen groves, rustic snow covered foliage accents, diminutive Christmas baubles and an elegant vase ideal for assembling your own decorative centerpieces! 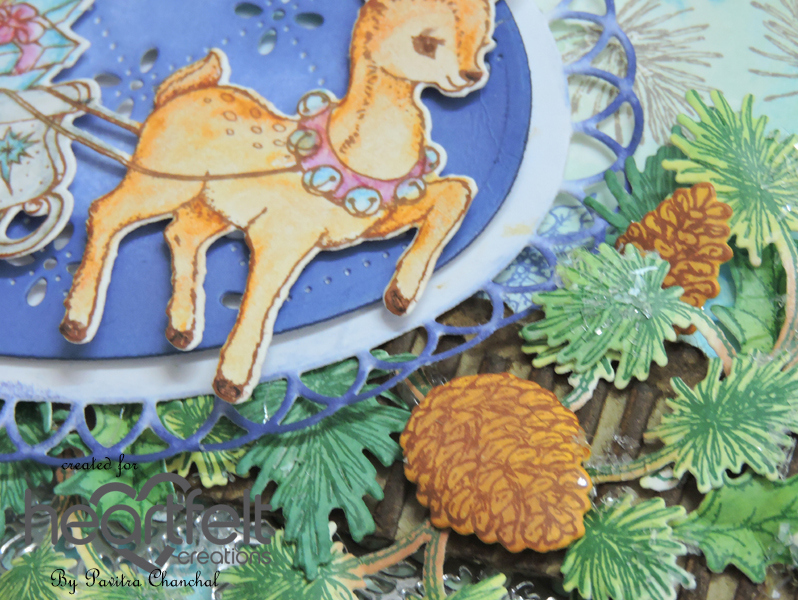 The perfect accents for creating delightful holiday themed dimensional embellishments for all of your Yuletide projects. So lets get started with this collections and make the festive season merry and bright. For the base of the card cut white cardstock 9 x 14, score at 7 from the longest side and fold. Next cut green cardstock 8-3/4 x 6-3/4 and adhere on top of white cardstock with clear dry glue. Cut pattern paper of your choice from the paper collection 8-1/2 x 6-1/2 and layer on top of green cardstock with clear dry glue. Cut iris paper 8-1/4 x 6-1/4.Press distress ink -cracked pistachio, salty ocean, chipped sapphire and wild honey on craft mat, and sprinkle water and swipe iris paper on inks. Next stamp the iris paper with pine image and small poinsettia images from the Merry and Bright Accents stamp set using Archival ink – Sepia and distress ink – Chipped Sapphire. Also heat embosses small poinsettia images with white embossing powder. 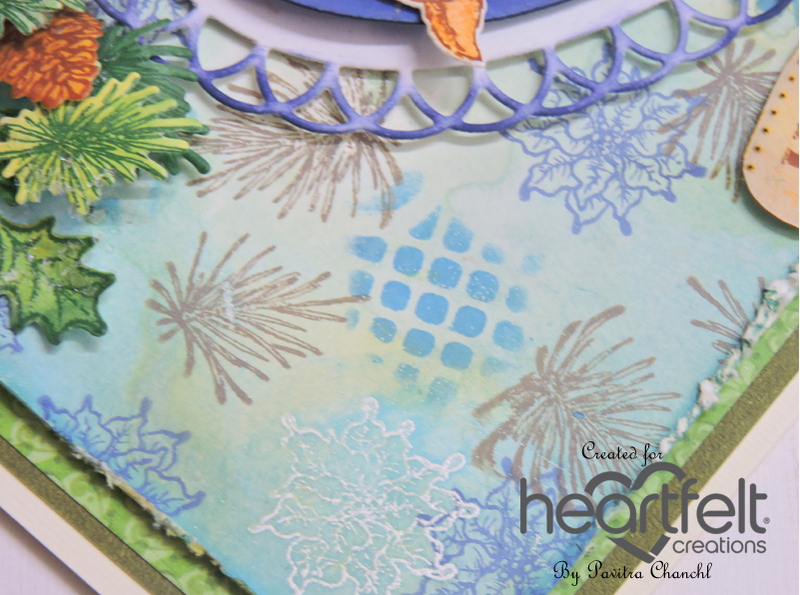 Distress the edges and adhere it with 3D foam tape on top of pattern paper. Tear corrugated sheet randomly and color using Archival ink – Sepia, adhere it on top of iris sheet. 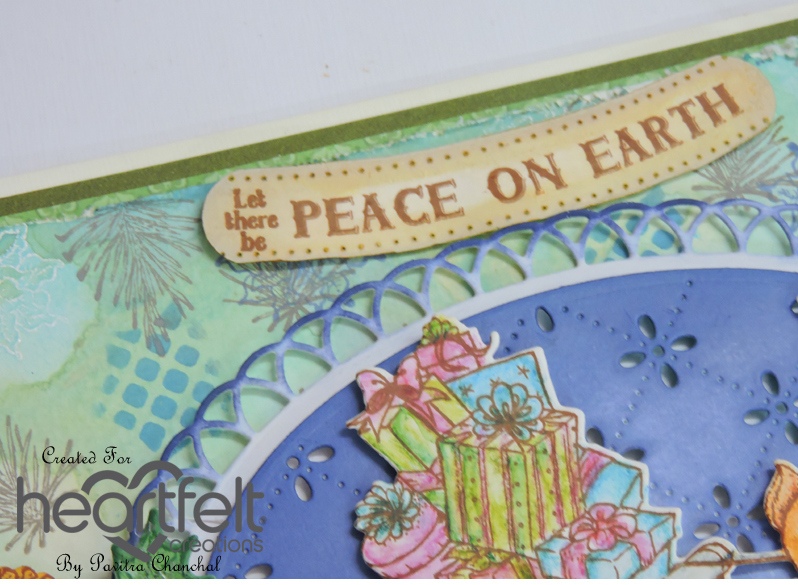 Cut silver mirror cardstock using Sweetheart Borders die and adhere it at the bottom of the corrugated sheet. 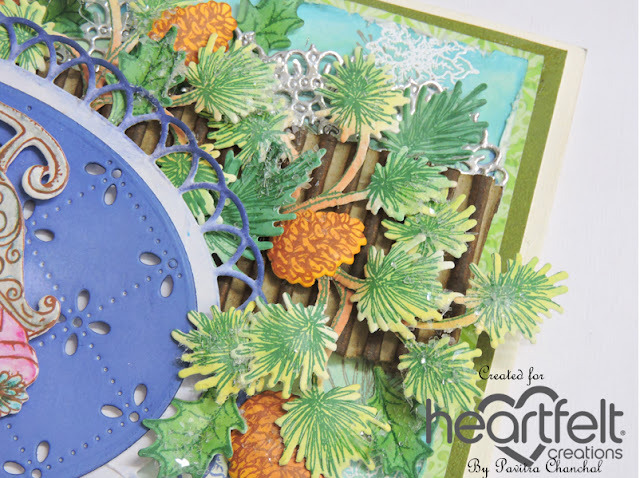 Cut white cardstock using the largest and smallest Eyelet Oval Die, sponge with Distress ink Chipped Sapphire and with 3D foam tape arrange it in the center of the card. Stamp white cardstock with leaves images from the Snowy Pine Village and Merry and Bright Accents stamp set using Archival ink – Library Green and cut using coordinating die. Color the images with Archival Ink– Olive and ColorBox Fluid Ink Olive Pastel. Stamp white cardstock with pine image from Merry and Bright Accents stamp set using Archival ink – Sepia and cut using coordinating die. Color the images with Distress ink wild honey. 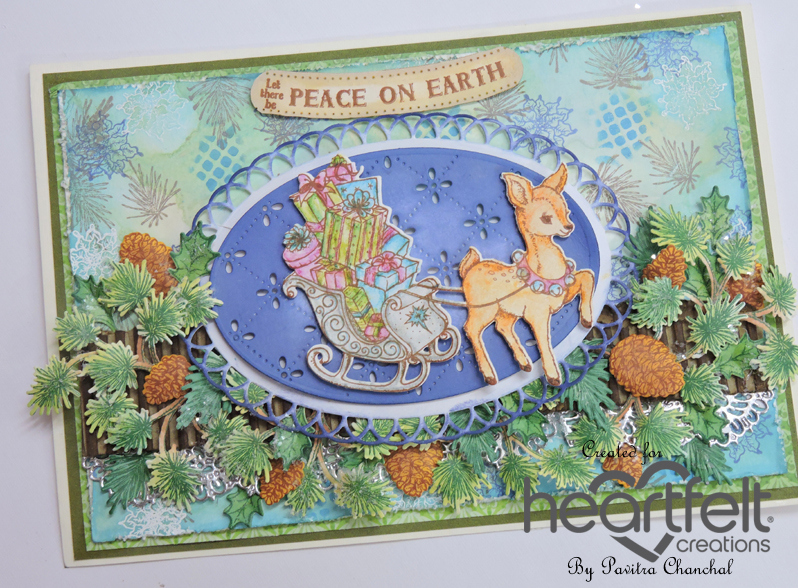 Stamp White cardstock with reindeer image from the Merry Little Christmas stamp set using Archival ink Sepia, cut with coordinating die and color the image with pencil colors. Once all the elements are ready arrange them as shown and finish of the card with sentiment. For more inspirations by other DT do visit Heartfelt Creations Blog . Beautiful card Pavitra! Love the blue and the gorgeous background! Such a lovely card! I love the wonderful designer paper you created with the stamps!